Have you ever wanted to save a couple of hundred dollars? Of course you have. Repairing a Craftsman self-propelled lawn mower at home will save your "rainy day fund" for something else. Replacing parts on a lawn mower is not as hard as you would think, and all necessary repairs will only take a couple of hours. 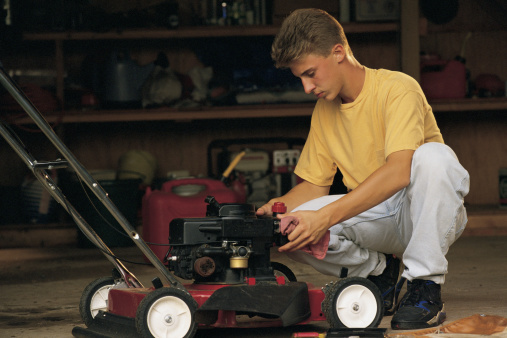 Replacing parts on a lawn mower is not as hard as you would think. Locate the self-propelled motor. If it's a front drive, the motor is between the front wheels on the deck. If it's a rear drive, the motor is between the rear two wheels. Pop the casing off with a flat screwdriver. Inside the casing, check the gears for any clogs. If you see any clogs, remove them with a screwdriver. If any of the gears needs replacing because of cracks, unscrew the gears with a screwdriver. Replace the old gear with a new one, and tighten it into place with a screwdriver. Spin each wheel. Look for any cracks. If a wheel looks bent, try tightening it by tightening the bolt in the middle of the wheel with a 3/8-inch wrench. If the wheel still looks bent after tightening the bolt, unscrew the bolt, and slide the wheel off. Replace the wheel with a new one, and tighten the bolt with the wrench. Inspect the spark plug located on the side of the motor. It is encased in a black hose. Pop it out with your hands, and check for cracks around the tip or for dirt clumps. If the plug has any cracks or is covered in extreme dirt clumps, throw the plug away. Pop a new plug into the hosing with your hands. 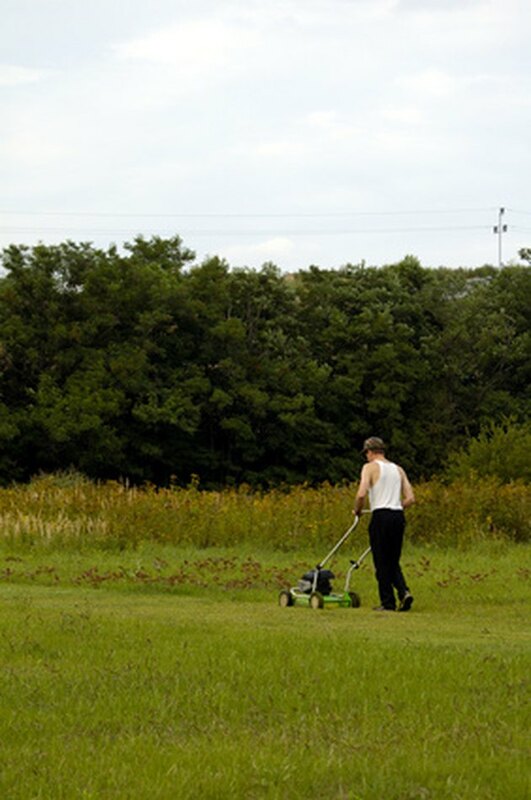 Turn the mower so that the handle is lying across the ground and the mower blades are visible. Check the blades for any dents and the arbor, which connects the blade to the mower, for any dirt buildup. Remove any dirt possible with a screwdriver. If the blade is out of shape, unscrew it from the arbor by removing the bolt located in the middle of the arbor with a 3/8-inch wrench. Slide the blade off the arm. Replace the blade with a new one, and slide the bolt back over the blade. Tighten the bolt with the wrench.